We’ll be treated to a front-row seat for the total lunar eclipse this coming Sunday night and Monday morning, January 20/21, 2019! Here are the local circumstances for Dodgeville, Wisconsin. This is the first total lunar eclipse visible in its entirety from SW Wisconsin since September 28, 2015; the next such event won’t occur again until May 16, 2022. You’ll note in the table above, the Moon will be 64° above the horizon at mid-totality. The Moon has not been this high in our sky at mid-totality since November, 29, 1993 (66°), and it will not be this high again at mid-totality until January 21, 2048 (67°). The first hint of shading will occur on the left (eastward-facing) edge of the Moon around 9:10 p.m. The first sliver of the full Moon enters the umbral shadow of the Earth at 9:33 p.m., so you’ll want to be watching by then. The entire Moon will be immersed in the umbral shadow of the Earth 67 minutes later at 10:41 p.m. This means that if you were anywhere on the nearside of the Moon you would see the dark Earth (except for city lights) completely covering the Sun, with a spectacular “ring of fire” all the way round the limb of the Earth refracting orangish-red light through our atmosphere—the combined light of all the world’s sunrises and sunsets at that moment. This, of course, will continue as the Moon penetrates deeper into the umbral shadow of the Earth, reaching its closest to the center of the Earth’s shadow at mid-eclipse at 11:12 p.m. The best place in the world to view this total lunar eclipse (assuming it is clear) will be Guantánamo Province in Cuba. Just 8 miles north of the municipality of El Salvador, Cuba, the Moon will be directly overhead at mid-eclipse. There has been an unfortunate tendency of the mainstream media in recent years to use the term “Blood Moon” to describe a total lunar eclipse. Why must we use imagery so often associated with violence, death, and destruction in our discourse? 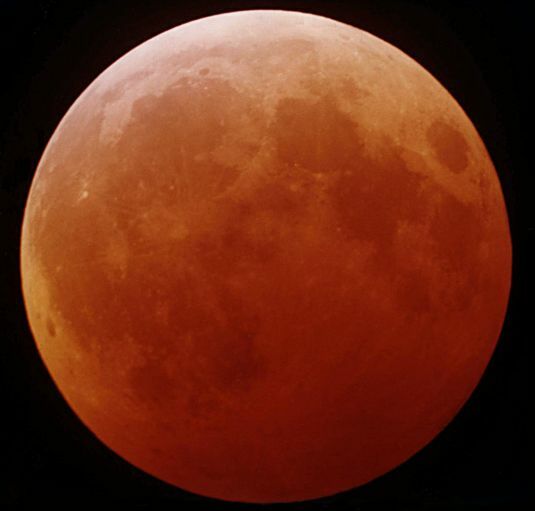 The color of a total lunar eclipse depends upon the condition and transparency of the Earth’s atmosphere during the eclipse, and it can range from orange to coppery to red, and rarely even gray or brownish, so why not say orangish-red and leave it at that?